At the heart of Scottsdale’s premier private golf club, is its members…members who show a great deal of heart for their community through a series of events and fundraisers. 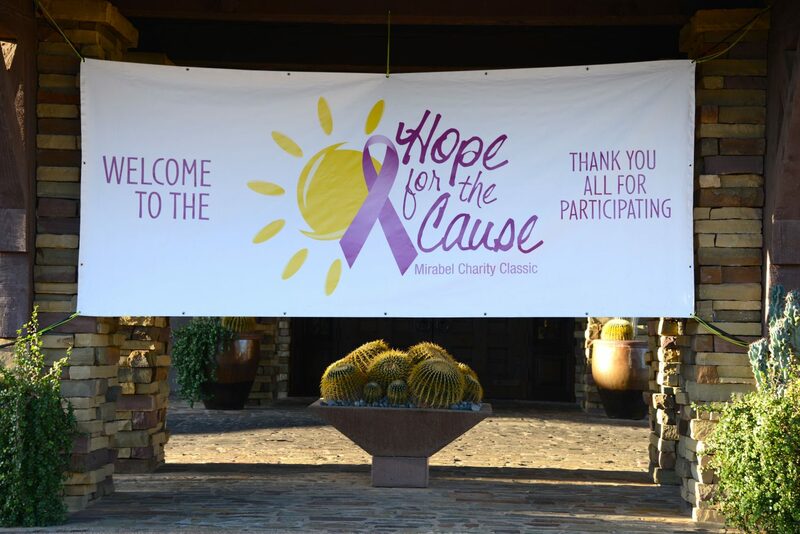 For the past seven years, Mirabel residents, members and friends have come together each March to raise awareness and funds for cancer research through its annual Hope for the Cause Charity Classic. The event raises awareness and funds for cancer research, and this year, exceeded the milestone of $1 million in total giving. Donations benefit the Scottsdale Healthcare Research Institute at Scottsdale Healthcare’s Virginia G. Piper Cancer Center. Specifically, the funds benefit the Cancer Clinical Trials Program. Under the leadership of Dr. Daniel Von Hoff, a world leader in cancer research, the nationally acclaimed program focuses on personalizing medicine to fight the war against cancer. Reaching this milestone is a true testament to the hard work and effort that Mirabel’s residents, members and friends put in to giving back to the community. The weeklong series of events included a 5k, men and women’s golf events and an evening reception with live and silent auctions. In addition to Hope for the Cause, Mirabel members stay active in their community year-round. The club has been a long-time supporter of the local high school, Toys for Tots and the Foothills Food Bank. A food drive and a women’s charity luncheon held at the club earlier this year raised $21,500 and brought in 225 pounds of food for the food bank to support individuals and families in the Foothills area that are in need. On May 18, Mirabel will also host the 4th Annual HopeKids Charity Golf Classic. The tournament will raise money to support HopeKids, which works to provide an ongoing calendar of events for families who have a child with a life-threatening medical condition. Mirabel Golf Club features an award-winning Tom Fazio course, exceptional fine and casual dining, social activities, championship-caliber Har-Tru clay tennis courts, state-of-the-art spa and fitness facilities and extensive health and wellness programs. Members are granted exclusive access to the spectacular 38,000 square-foot, Frank Lloyd Wright inspired, Desert Lodge Clubhouse and a variety of community events. The North Scottsdale club offers both golf and social memberships. Property ownership is not required for membership, but availability is limited. For more information about Mirabel, visit www.mirabel.com. To learn more about current membership opportunities contact Michele Massambani at 480-437-1502 or email michele.massambani@mirabel.com.